The Resolution Foundation’s predictions for government spending, based on the different parties’ declared plans. Vox Political’s article on Nicola Sturgeon’s London speech provoked a disgruntled response from Jonathan Portes. The NIESR boss sent a message stating that the article’s fiscal arguments were out of whack. He didn’t ask for this blog to straighten them out, but the information he sent, coupled with some other pieces he suggested – by Professor Simon Wren-Lewis and the Resolution Foundation – make it inevitable that another stab is required. If you support the SNP, you’re still not going to like it. There’s a major point to make here, which all three of the sources above have missed. It’s that the SNP and its adherents have been cursing Labour from High Heaven to Low Hell for committing to Tory austerity policies because Ed Balls promised a Labour government would stick to Coalition spending – note that word, spending – limits for the first year after the general election. Why have SNP adherents been slating Labour when the SNP has committed itself to the exact same Conservative spending limits, for the exact same period of time? Doesn’t this also make the SNP a party of austerity? This leads us neatly to a point made by the Resolution Foundation. Ms Sturgeon wants to put a lot of space between SNP plans and those of Labour by claiming that Labour is committed to eliminating the UK’s structural deficit by 2017-18. They say Labour signed up to that when it voted to support the Charter for Budget Responsibility. You may recall there was another big fuss about Labour supporting Tory austerity, being just the same as the Tories, and there being only 17 MPs who oppose austerity (the number who voted against the CBR). Bunkum, according to the Resolution Foundation. “The ‘Charter for Budget Responsibility’ is highly elastic: it’s not based on a firm commitment to reach balance in 2017-18,” states the Resolution Foundation article. “Instead it represents a rolling ‘aim’ of planning to reach current balance three years down the road.” The article adds: “Most economists are sceptical about how much difference it (the charter) will make. Labour has made it clear that it plans to make only £7 billion of cuts. As this coincides exactly with the Resolution Foundation’s figures for a 2019-20 budget balance, logic suggests that this is most likely to be what Ed Balls is planning. So SNP (and Green) adherents who crowed about Labour austerity being as bad as that of the Tories need to apologise – sharpish. Now that these points are cleared up, let’s look at the substantive issue. Here’s the Resolution Foundation again: “The first minister’s headline was that she favours £180 billion of extra spending in the next parliament relative to current coalition plans… an increase in ‘departmental spending’ of 0.5 per cent a year in real terms over four years [we’ve established that the first year’s spending would adhere to Coalition-planned spending levels]. Our estimates suggest that raising departmental spending by 0.5 per cent in each of the four years after 2015-16 would indeed yield a cumulative increase in spending of around £180 billion (in 2019-20 prices, £160bn in today’s) compared to existing coalition plans. So that seems to fit. As you can see from the graph, the scenario that suggests a Labour balance in 2017-18 would imply a big difference with the SNP, particularly in the first half of the next Parliament – but, come 2019-20, “there would still be a £48 billion gap between Labour and the coalition plans; not that far short of the £60 billion gap that would exist between the SNP and the coalition”. 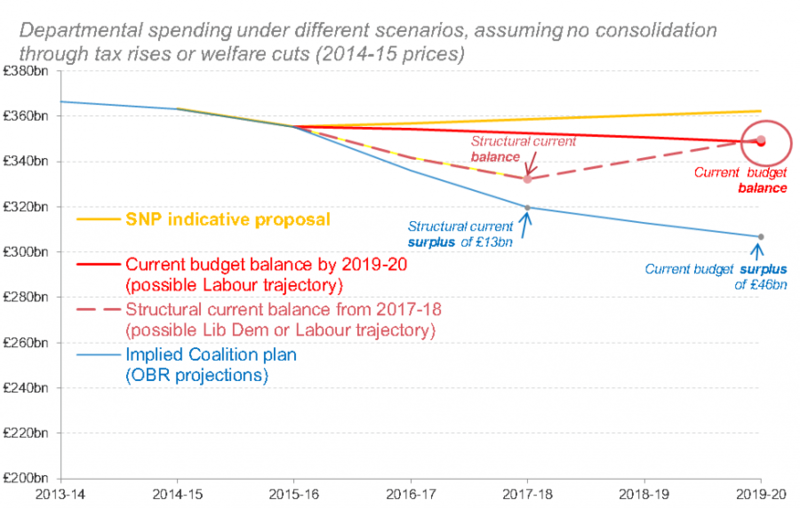 The scenario in which Labour balances its budget by 2019-20 “would in theory be consistent with spending roughly £140 billion more than coalition plans. It’s more or less the same amount the Coalition Government borrows every month, in fact. But that is exactly what Ms Sturgeon was proposing for the whole of the UK; borrowing on the assumption of increased productivity. The Resolution Foundation notes that “the flipside of higher spending, all else equal, would be higher debt and higher debt interest payments”. So the SNP plan, as this blog pointed out, could create an interest-payment problem for the next government that bites into the extra money said to be for services. When I wrote the material about Labour spending more in a better-performing economy, I was thinking of the Labour government immediately after World War II. The current Labour Party has mentioned this period in recent speeches and releases, and it seems clear that Messrs Miliband, Balls et al consider their task, if elected in May, to be similar to that faced by Mr Attlee and his party – the reconstruction of the UK after a long period of destruction. Are we to believe the economy is likely to worsen, in which case more borrowing will be needed? It’s certainly possible that major shocks are on the horizon. This writer is in no position to speculate. “3. Finally, stuff about credit rating agencies/bond markets/Greece is absurd propaganda. I’ve written on this many times.” He’s right; it wouldn’t have been included it if Yr Obdt Srvt had stopped to think about it, but the article was up against a deadline and this writer was throwing in all the cautionary words he could find. Is the SNP rational? All the evidence available so far suggests it isn’t. It put forward arguments that were deceptive about an independent Scotland’s economic future. Its representatives and followers spread lies about Labour economic policy. All indications suggest the SNP will try to create the conditions required for Scottish independence at the earliest opportunity, and then leave the rest of the UK hanging. The original article on Ms Sturgeon’s speech ended by saying the SNP would be hard to trust. After the findings of this one, it is nigh-on impossible to do so. discussing the major implications of the big vote in May. Mike, thanks for wading through a complex set of arguments and details to produce such a lucid account of the disaster that would be an SNP victory in Scotland for both the U.K. and Scottish people. Salmond? Sturgeon? There is something fishy about the SNP. You’re having a whale of a time with that, aren’t you? Aye Mike you change your tune as quick as you change your socks, if i remember correctly you your self were calling for a halt to the austerity policies of the conservatives not that long ago are you now advocating for the austerity programs ?? Don’t make me laugh – I’m not for austerity at all and I don’t think Labour is either. Instead, Labour is accommodating the wishes of a public that has been influenced by the right-wing press into thinking that the deficit must come down as soon as possible, and has devised a plan in which this can be achieved with a very small amount of cuts (if any at all – see my previous comment). Labour has been attacked as the party of ‘Red Tories’ (or whatever insulting term you wish to use) by the SNP, the Greens and their followers for agreeing to follow Conservative spending limits for the first year after a general election, but it seems clear the SNP is planning the same strategy. Doesn’t this make them ‘Tory-lite’ too, then?